Kindle Paperwhite covers are available in a variety of materials, from fabric to leather to neoprene, at prices ranging from less than $20 to more than $200. To get a sense of the variety out there, go to Amazon and choose Kindle→Accessories from the navigation menu at the left. On the page that appears, you’ll see covers featured prominently. Tabs: Simply slip the Kindle Paperwhite under the tab in each corner to hold it in place. Covers from Belkin, M-Edge, and Oberon are popular examples of covers that use tabs. 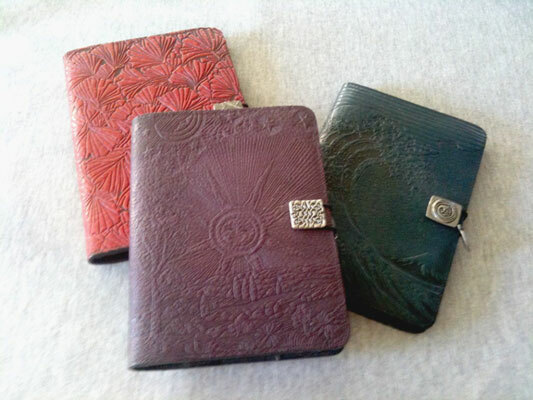 Oberon Design, a small family-owned business based in Santa Rosa, California, makes hand-tooled leather covers, such as red Gingko, purple Roof of Heaven, and navy Hokusai Wave. Drop-in/snap-in: Drop the Kindle Paperwhite into a snap-in frame. The Amazon cover uses this design. 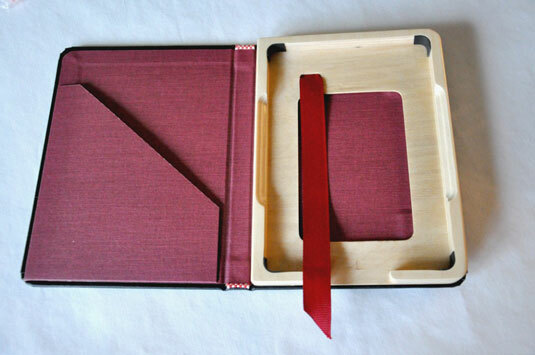 Pad & Quill makes a wood and leather snap-in case that looks like a book when closed. The newly designed cover from Amazon deserves special mention due to its unique feature: Open the cover and the Kindle Paperwhite turns on; close the cover and it puts the device to sleep. This “magic” is accomplished by a small magnet built into the corner of the case. The cover is made of leather with a felt lining on the inside front cover and is available in seven colors. 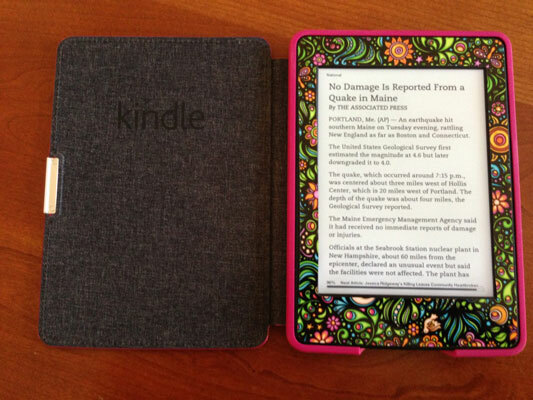 The figure below shows a Kindle Paperwhite sporting a vinyl skin from DecalGirl. Amazon recently introduced a cover that you can customize by adding a favorite photo. As of this writing, reviews on the appearance and attractiveness of the cover are mixed. Choosing a high-resolution photograph and realizing that the texture of the cover will show through seem to be key for customer satisfaction. If you put a small magnet in the corner of any cover with a front pocket (such as the one from Oberon), the cover will wake up your Kindle Paperwhite automatically when you open it and put it in sleep mode when closed. The Kindle Paperwhite is a delicate electronic device that can be damaged by moisture, dust, sand, or soot. If you regularly read outside at the beach or next to the pool, consider a plastic jacket or case to protect your device like the the Medium Whanganui case from Aquapac: This case floats and is submersible up to 15 feet. The company offers free shipping on orders over $20. For an inexpensive alternative, put your Kindle Paperwhite in a plastic one-quart reclosable storage bag. You can still read the screen and navigate with the touchscreen. Many Kindle Paperwhite users choose a jacket for protection and convenience. Jackets are typically made of fabric, such as canvas or microfiber, and secure the device inside, usually by corner tabs. In addition, jackets have a zipper closure, which provides more security than a cover. Some jackets have extra features, such as a front pocket or a place to store the USB cable. Jackets provide all-in-one security in a convenient, lightweight package. You can find a wide variety of jackets in the Kindle Store on Amazon. While on your computer, from the Search drop-down list, choose Kindle Store, type accessories jackets on the search bar, and click Go. For $50, you can design your own jacket at M-Edge using your own artwork or photographs.